Have you been missing out on those footie get-togethers because of your erratic work schedules? Well, you don’t have to anymore, we found not one but three football arenas where you can kick the ball until midnight! Dedicated to nurturing football in Bangalore, Kicks on Grass offers well-equipped Astro Turf pitches with floodlights too! They offer football coaching, open and corporate tournaments as well as a pay and play system. You can sweat out the day’s stress by getting your peeps together and booking a slot. The best part is they stay open till they have bookings. That means you can get a late night slot and tire yourself out playing with your friends! Football Alley is an arena that also provides you with the opportunity to round up a team and play your heart out after hours. 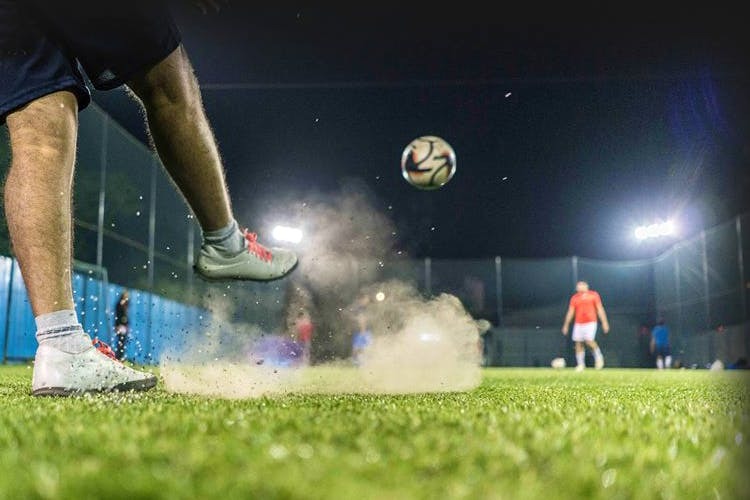 With 8,500 sq ft of top quality artificial turf, you can play up to 7 a side till midnight! So stop missing out on those football sessions and check out Football Alley’s late-night plans. Smash and Sprint is a football and badminton space where you can book a court and play. They have a pretty good football arena with floodlights and all that jazz too. Whether you are a professional soccer player or an amateur one, all are welcome at Smash & Sprint. All you have to do is get a group together and book your slot! After that, it all depends on the game.